There are a lot of unfounded fears about vaccines these days, but here are five really dangerous vaccines that have appeared in movies and television you may want to avoid. According to a report in Arizona Republic thousands of Arizona schoolchildren skipped their recommended vaccines during the 2010-11 school year. If more than ten percent of the population is unvaccinated we're all in big trouble. These people are cranks and wackos. But, it wouldn't have been a bad idea to have some of these nutballs around to stop the following vaccinations. 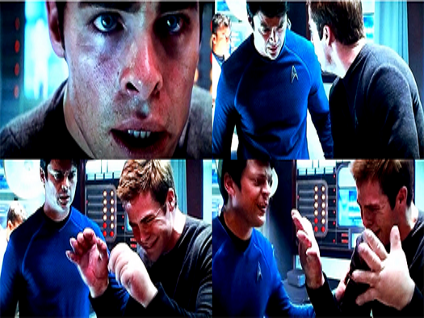 In the movie Star Trek 2009 McCoy gets Kirk onto the Enterprise by injecting him with a vaccine for "Melvarian Mud Fleas." Whatever those are. It's supposed to create temporary flu-like symptoms, but instead makes him loopy and swells up his hands to Popeye-like cartoony size. It also caused "Slap-Stick Comedy Syndrome" which causes nausea and groaning in large segments of the audience. 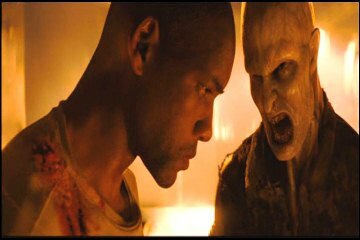 A vaccine for cancer is discovered in the film I Am Legend (2007) called KV that inadvertently kills 90% of the world's population. That's five point 4 billion people. Of the survivors five hundred and eighty-eight million turned into vampire-like carnivorous mutants. They killed and ate most of the rest. So, it might have been a good idea to skip that one. In the television show V the aliens looked friendly enough. They created healing centers and started curing cancer. They also started giving out vitamin supplements and flu vaccines. Turns out the vaccines were laced with a compound known as R-6 which acted as a tracking device. This allowed animal-like "Tracker" aliens to hunt people down and kill them. Good thing the show got cancelled before the government started thinking about it too. The ultimate conspiracy theorist show X-Files took a new approach on the Smallpox vaccine. 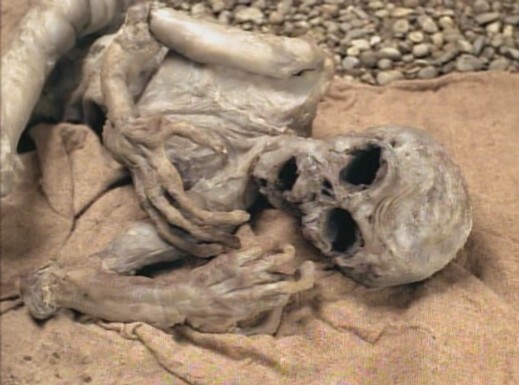 First, in the episode "Anasazi", alien-human hybrid bodies that Mulder found had smallpox vaccination scars. Weird. Then, the two heroes find a comprehensive DNA database for every man, woman, and child born since the 1950s, secretly collected during smallpox inoculations. Pretty scary stuff, but then it turns out Smallpox is deadly to aliens. So, they started using the vaccine to fight the aliens. In a way, vaccines turned out to be a good thing. Ironically enough, Amanda Peet, star of the film X-Files: I Want to Believe with all it's conspiracy mumbo-jumbo, said parents who don't vaccinate their children are "parasites." The reality is that vaccinations for children are scientifically proven to be safe and anything else is science-fiction. Vaccines for things like Measles and Smallpox are vital. So, until we come up with vaccines that accidentally turn us into vampires, vaccinate your kids. What do you think the most dangerous vaccine in sci-fi was? Do you think we should avoid vaccines in real life?